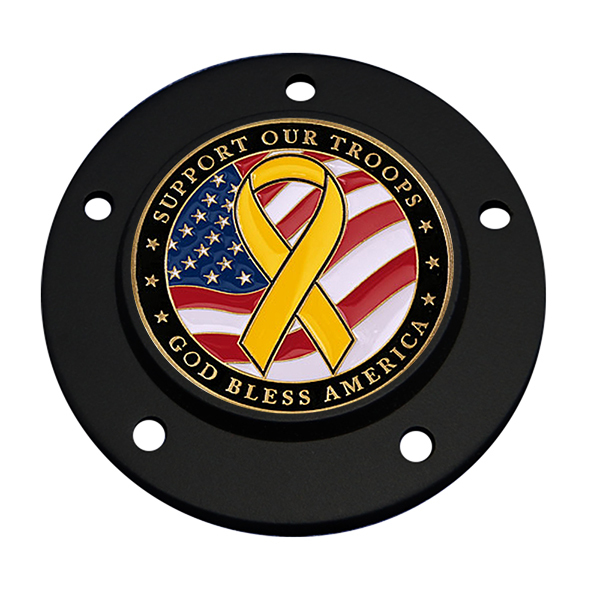 MotorDog69’s Black Harley Timing Cover Coin Mount with “Support The Troops” coin. · Fits 1999 to 2016 twin cam engines, replaces your stock Harley Timing Cover, no modifications needed. · "Add a piece of your life to your bike" with MotorDog69's Challenge Coin Mounts. · Find out why thousands of our customers are riding with pride, when they mount something meaningful on their bike. · Now you can "Mount a coin, ride with pride, pop coin out, and remount a new coin, to get a new personalized look." · USA Patented and Engineered, standard matte black powder coat finish, gloss black also available, please specify. 2 hole Timing Covers also available for Evo, Sportster and some S&S engines, please specify in the dropdown menu below the sales price on this page. · Bundle Includes; Black Timing Cover Coin Mount, Challenge Coin Shown, 5 New Stainless Steel Screws and Easy to Follow Instructions. Personalize Your Ride Today! · Kit Benefits; Easily mount and remove challenge coins on your Harley engine, no modifications needed. Coin can be popped out, and new coin remounted to get a new personalized look. · Coin attaches with rtv high-temp silicone found on our website. · The feeling you get when you mount a personal challenge coin on your bike, is something only our customers know. · MotorDog69 Is The Inventor and Designer Of The World's 1st Adaptable Challenge Coin Mounts For Motorcycles And All Vehicles. "Mount a coin, ride with pride, pop the coin out, remount a new coin, get a new personalized look."